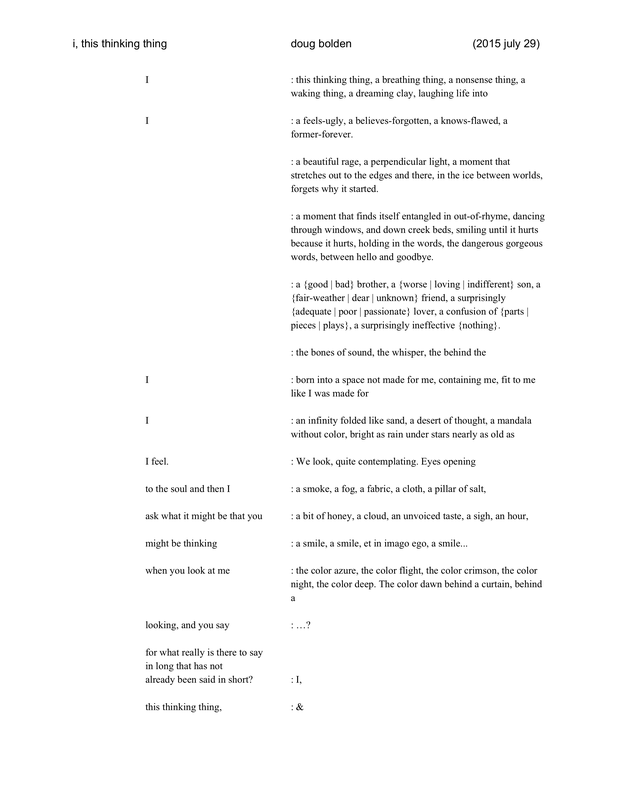 Poem: "I, This Thinking Thing"
I have written a poem. One of my first poem-for-poetry's-sake since I don't know when. I've had a few incomplete bits over the past few years, but the last poem-for-poetry's sake I remember writing to completion and enjoying was "Eventually, Someone Says I Love You", nearly six years ago, which was a poem whose whole point was that the young couple-to-be never once said anything about love and seemed to be making a poor attempt at it—which of course is the greatest testament to their love—, and is one of my more beloved attempts. This new poem grew out of three things. Its initial creation was my own feelings about my failure as a brother after Shawn died, all the ways that I could have done something proactive or reactive, though mostly all I was able to do was to feel sad and angry about the whole mess. That version of the poem would have probably been less good, and would have been something like an extended mea culpa of self-hatred with word play. The structure, below, was one that I had in mind from early on, but it would have been more hamfisted in the original. That version is unwritten, and as far as I am concerned, can stay as such. The other two things were two conversations I had with a friend. The first was about the use of the word "I" in a number of her poems, and how I used to use the word "I" too much, and how "I" is dangerous in poetry. Not only does it take all of your existence and compress down into a single word, but it disrupts the reader: they have to either decide the poem is about them, and accept all inside, or read it as merely about the poet, which has its place but must be used carefully. Which means, of course, I wrote a poem in which "I" is essential to the structure because, you know, I am petulant about rules. The second conversation with the friend was, in part, actually about Shawn. Along the way, I started talking about Martin Buber's I and Thou, the notion of how recognizing someone else's infinity and complexity can help you to understand your own, but I feel understanding your own infinity is a lot harder than realizing you are a complex space-time-event. It is easy to label yourself with multiple labels—nerd, librarian, friend, lover, mediocre dancer, smoker, poet, reader, swamp-rat born, etc—but kind of hard to realize that none of those labels mean anything except as the shallowest of starting conditions. We project ourselves unto the world, but often only in broad strokes, and therefore reduce the world to a pitiful cognitive dissonance. Just because we are being honest about who we think we are, does not mean we are not liars [with apologies to E.M. Cioran]. In such, the poem became a love-letter, but the "eventually, someone says I love you" unvoiced love moment is the poet getting comfortable with what "I" might mean, again. Along the way, the voice—which is of course, me, but hopefully not so much that it cannot understood by others—stops seeing itself only as a series of labels, and starts seeing itself as a relationship between others. In the end, when asking what the other person might be thinking, the only answer is a voiceless question, "...?". Communication of self becomes only an ampersand, which should probably be unvoiced in the reading-aloud of the poem. Therefore, nearly unique to my writing, this is a love poem to myself, but also a love poem to those who have sat beside me and talked about things both silly and sublime and sultry and paltry and pathetic and sad. All of you. Hello, world, you know who are. Due to the complexity of the line structure, I have posted this one as an image. It might not look great zoomed in, but click it and you can see it a little more full-page. You can also see "I, This Thinking Thing" as a PDF file.